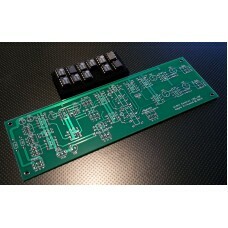 This is the Stereo Width Controller for audio mastering based on the design published in the Pro Audio Design Forum. The Width Controller uses a high accuracy THAT1240 line receivers to perform audio sum and difference functions providing crosstalk performance unobtainable with conventional precision resistors. The Width Controller maintains signal in the Left and Right domains processing only Side to either add or subtract Side information providing adjustment of Stereo Width from 0 to 200%. The final processed signal is fully mono compatible. THAT1246 line receivers and THAT1646 OutSmarts® line drivers provide fully-balanced I/O for the left, right, and side insert inputs and outputs. The THAT1240s used in the Stereo Width Controller provides resistor ratio matching performance that is typically >60 dB across the full audio band. A Width bypass relay allows rapid "A-B" comparison. RMAA test results for the LRS-1 Width Controller in circuit and set at 100% for normal stereo. RMAA test results for the LRS-1 Width Controller in bypass. A relay-bypassed Side Insert permits insertion of dynamics, EQ or an external low-pass filter to make the controller function as a mastering elliptic equalizer. The construction and document thread for the Stereo Width Controller is featured in the Pro Audio Design Forum. The Stereo Width Controller is sold either as a bare PC board, a "kit" including THAT1240, THAT1246 and THAT1646 ICs, or a fully-assembled and tested module. For DIY builds a Mouser Electronics Project Manager bill-of-materials is available.